This Thursday May 30th on SuicideGirls Radio hosts Nicole Powers and Juturna Suicide will be joined in studio by rock supergroup Heaven & Earth. When we saw them play live recently at the record release party for their new album Dig they blew us away, so we’re thrilled that they’ve agreed to play a very special acoustic set for us. This is a show you won’t want to miss. Prepare to have your world seriously rocked! You can listen – and watch – the world’s leading naked radio show live on Thursday nights from 6 til 8 PM at our new state-of-the-art all digital home: TradioV.com/LA. ICYMI: Here’s the recording of last night’s show feat. an interview with – and an incredible live acoustic set from – Heaven and Earth. Taking up from where iconic bands like Deep Purple and Bad Company have left off, Heaven & Earth is on a mission to resurrect the sanctity of classic rock to its purist, most accessible form. 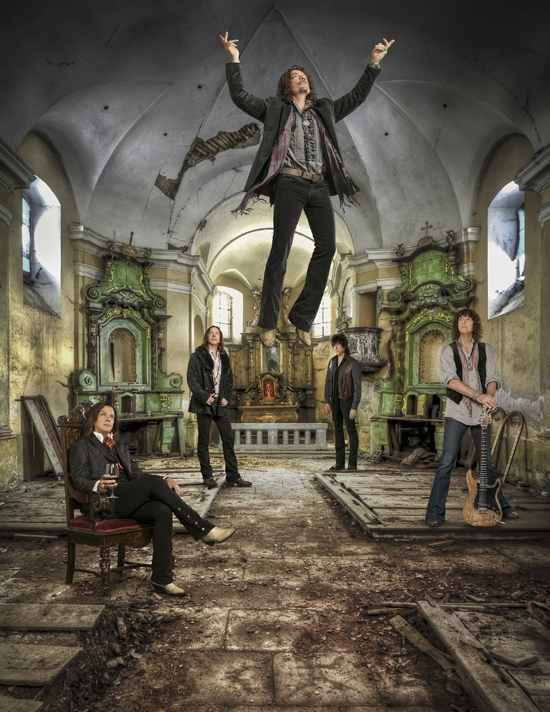 Heaven & Earth fuses elements of hard rock, blues, even bits of classical, to create a potent blend of high-powered anthems, melodic rockers and introspective ballads that evoke the spirit of a magical era. Tapping into the methodology and madness of old-school rock with a new-school attitude, Heaven & Earth are shaking their classic rock roots down to the very core on their newest effort, Dig (Quarto Valley Records). The album, produced by Dave Jenkins — who’s turned the knobs for everyone from Metallica to Tower of Power — features guitarist Stuart Smith, singer Joe Retta, bassist Chuck Wright, drummer Richie Onori and keyboardist Arlan Schierbaum, along with special guests Howard Leese (Heart, Paul Rodgers) and David Paich (Toto) and Richie Sambora (Bon Jovi). The origins of Heaven & Earth align the guitarist with a rich lineage of rock’s most celebrated musicians. Kelly Hansen (Foreigner), Joe Lynn Turner (Rainbow) and Kelly Keeling (King Kobra) all fronted the band at various junctures. Guitarist Richie Sambora (Bon Jovi), singer and bassist Glenn Hughes (Deep Purple, Black Country Communion), and drummer Carmine Appice (Vanilla Fudge) have each contributed their extraordinary talents to the music of Heaven & Earth. Heeding Blackmore’s advice, he migrated to New York and after three years jamming around Manhattan and Long Island, headed west to Los Angeles, where he’s been ever since. Smith established himself as an in-demand guitarist in LA, playing countless sessions and joining up with other British expats like Keith Emerson and Sweet. Around the same time, Heaven & Earth was conceived as a side project, something to cultivate Smith’s creative juices between stints working with others. A few false starts and random gigs in, he recruited Richie Onori and singer Kelly Hansen to record the first album, Heaven & Earth Featuring Stuart Smith. He also invited along a few heavy friends like Richie Sambora, Joe Lynn Turner, Glenn Hughes, Carmine Appice, Howard Leese, Chuck Wright, Arlan Schierbaum, Robbie Wykoff and many more to appear on the record. Windows to the World, produced by Howard Leese, followed in 2000 and featured Onori, Wright, Schierbaum and singer Kelly Keeling. Four years later, when Smith and Onori started their own label, Black Star Records, to reissue the first Heaven & Earth CD, they recorded a four-song EP called A Taste of Heaven with Paul Shortino handling the vocals. In the summer of 2012, the guitarist tendered his resignation to Sweet bassist Steve Priest and set out to mold Heaven & Earth into a world-class recording and touring band. Having Retta, Onori, Wright and Schierbaum committed and on board, Smith says Heaven & Earth is now a “real band,” ready to unleash its unique brand of classic rock upon an unsuspecting public. Dig is very much a collaborative effort. Quarto Valley Records has been integral in allowing the band to develop and nurture the album without pressure. For more on Heaven & Earth visit their website, Facebook, Twitter and Youtube channel.